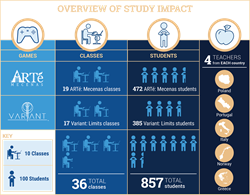 More than 850 students playing Triseum's art history game ARTé: Mecenas™ and calculus game Variant: Limits™ during the 2017-2018 academic year. To realize the positive impact that our games are having on students, not only through our own assessments, but through compelling third-party research, is inspiring," said André Thomas, Triseum CEO and Texas A&M professor. In a new game-based learning validation study, participating teachers agreed that Triseum's immersive academic games had a positive impact on student engagement, motivation to learn and knowledge acquisition. The study, which was conducted in collaboration with the European Schoolnet (a network of 34 Ministries of Education across Europe), followed more than 850 students playing Triseum's art history game ARTé: Mecenas™ and calculus game Variant: Limits™ during the 2017-2018 academic year. "Everything we do at Triseum starts and ends with student success. To realize the positive impact that our games are having on students, not only through our own assessments, but through compelling third-party research, is inspiring," said André Thomas, Triseum CEO and Texas A&M professor. "Additionally, instructors confirmed that our games attracted students' attention, increased students' confidence and social skills, and allowed students to exercise their imaginations. Through this study, the power of game-based learning comes to light across the globe, validating games as not only innovative, but effective." Most students showed behavioral, emotional, cognitive and agentic engagement. There was strong motivational potential of game-based learning with respect to both games. Students learned within the scope of the proposed goals and the overall impact on knowledge acquisition was perceived as positive with both games and the game-based learning approach. "Variant: Limits inspired our students to be far more involved with the subject as students developed investigative spirits, critical thinking skills and deeper enthusiasm for calculus," said Carminda Marques, math teacher at Escola Secundaria de Fafe in Portugal. "If you were to ask any of our students, playing Variant: Limits made practice more fun, not to mention we as teachers saw overall better performance." Marc Durando, Executive Director of European Schoolnet, commented, "Immersive and sophisticated games, such as Triseum’s Variant: Limits and ARTé: Mecenas, integrate more dynamic and real-world activities into the learning experience, and based on this initial research, it is a model that appears to work. We are encouraged by these first results and look forward to keeping the research, dialogue and momentum moving forward." Both the executive summary and the complete study are available through European Schoolnet's Future Classroom Lab. Additionally, teachers shared their feedback and findings in two webinars. Archives of the Variant: Limits results webinar and the ARTé: Mecenas results webinar are posted. "We appreciate the opportunity to engage with all of the participating teachers who shared such valuable insights and we are grateful to European Schoolnet and the University of Würzberg for their dedication to producing a meaningful and thorough report," concluded Thomas. European Schoolnet is the network of 34 European Ministries of Education, based in Brussels. As a not-for-profit organisation, we aim to bring innovation in teaching and learning to our key stakeholders: Ministries of Education, schools, teachers, researchers, and industry partners. European Schoolnet’s mission is to support relevant education stakeholders in Europe in the transformation of education processes for 21st century digitalized societies. Our remit is to identify and test promising innovative practices, share evidence about their impact, and support the mainstreaming of teaching and learning practices aligned with 21st century standards for the education of all students. Triseum grew out of the LIVE Lab in the Department of Visualization in the College of Architecture at Texas A&M University. Education will always remain at the heart of this learning company. Partnering with industry leading experts in gaming and instructional design, Triseum creates entertainment quality, immersive learning games for foundational subjects where high school and higher education students face challenges with engagement, course completion and success. Delivering world-class digital experiences that profoundly impact students while maintaining strict learning efficacy backed by rigorous research, Triseum's bold curiosity means pushing the boundaries of what educational games are all about. For more information, please visit https://triseum.com/.